petition: MK FANS UNITE! We Want an MK Lore Encyclopedia! MK FANS UNITE! We Want an MK Lore Encyclopedia! With Mortal Kombat 23+ years running and not a single book including the lore is out there. We need an MK Encyclopedia! Shawn Kittelsen has already said he'd love to author it, and with 20+ years and around 70 characters, us MK fans would love to have an at-hand hardback type book with everything based on the MK Lore at our hands! 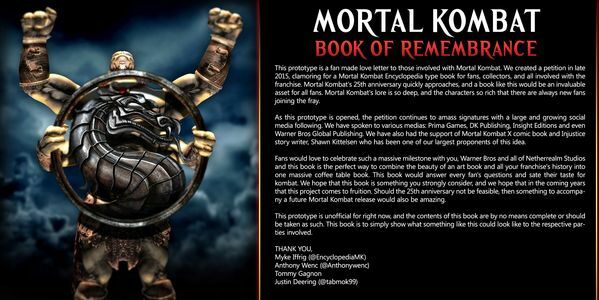 Signing this petition will let those up above (DC Comics, Shawn Kittelsen, Ed Boon, Netherrealm Studios, Etc) know that YOU want an MK Encyclopedia! We have spoken with DK Books and they are definitely interested in doing this book. We have updates coming, but this is a huge step for the MK Encyclopedia! We have also spoken to Prima Games and made contact with various folks within WB. The project has interest. To see our prototypes in action, check out the following videos! We as Mortal Kombat fans would like to finally have a definitive book encompassing the Mortal Kombat Lore. Over the previous 20+ years, we have had a bunch of games and comic books, yet we have nothing like this. When your game is built around lore, you need something like this for your fan base. Marvel and DC comics both have various encyclopedias. Something like this would be vital for the old fan base and the new, and would be an essential collector's item for every fan. We are petitioning you to make this happen, to make this a reality for all fans of the long running series. We did it. We reached 10,000 signers. WOW. Incredible. We thank each and every one of you for doing what you have to get this out there. We promise we will not let you down - We are trying constantly to get this book made for fans! We will not stop. The new video by Bruskpoet productions is uploaded! Thanks so much for the help! Soon there will be a video uploaded by Youtubers Bruskpoet and Uncagedgamez coming up! We can do this, guys! 3000! Come on! Due to comments from author S. Kittelsen, we may have to hit 3000 to really get this thing off the ground. 1000 was tough, but we can do this, guys! Keep signing and sharing!